These were two of the many questions fielded by Nancy Davis, who with Anne Mueller is co-artistic director of the The Portland Ballet, immediately following the conclusion of their spring concerts at PSU’s Lincoln Performance Hall on the last Saturday in May. And I couldn’t help thinking that these and other questions were inspired by the palpable pleasure the young performers were taking in being on stage, dancing their hearts out in a difficult program that demanded the mastery of quite different techniques and styles. The program was keyed to ballet history in Portland and elsewhere, and began with Les Sylphides, the Michel Fokine ballet that Diaghilev’s Ballets Russes performed here a century ago, in the spring of 1917. Set to an arrangement of Frédéric Chopin’s music by that most Russian of composers, Alexander Glazunov, it premiered as “Chopiniana” at the Maryinsky Theatre in St. Petersburg in 1907. The version performed by TPB, its third revision by the choreographer, was made for the Ballets Russes’s first tour to Paris, and premiered at the Théâtre du Chatelet, in 1909, with Anna Pavlova and Vaslav Nijinsky heading the cast. There are few gratuitous pyrotechnics in any of Fokine’s ballets: He was a ballet reformer, if you will, best-known today for this ballet as well as The Firebird and Petrouchka, in which the choreography is matched with the subject (folk dance figures somewhat in Sylphides, specifically the mazurka, and prominently in the other two) and solos and duets are in service to the narrative. The minimal story for Les Sylphides is this: a poet, male of course, wanders into a forest glade containing a number of Sylphides, spirits who are needless to say female (there were 12 in TPB’s corps) and dances with them. Fokine’s take here on 19th century Romantic ballet calls for softness, fluidity, particularly in the port de bras, and light, quick pointe work. On the whole, the corps de Sylphs did better with the port de bras than the footwork, which takes considerable finesse. That will come in time: This is, after all, a student company. As the dreaming poet, Henry Winslow was particularly good in the concluding Pas de Deux, dancing with Naomi Rux, who nailed the Prelude solo and clearly took enormous pleasure in doing just that. Rux will soon join Ballet Idaho as an apprentice, and they’re lucky to have her. Every cast member in George Balanchine’s Who Cares? appeared to take just as much pleasure in dancing four excerpts from a ballet that, despite the Gershwin score and the jazzy choreography, usually leaves me cold. Not this performance, and that’s because of the way it was danced. Evan Lindsay, who is headed to Ohio for an apprenticeship with Ballet Met, gave a show-stopping performance in “Liza,” a solo calling for speed and elevation; and Winslow and Lauren Kness, who dance together a lot, were lovely in “Embraceable You.” They were guest artists last December with the Dominican Republic’s Ballet Concierto Dominicano’s production of The Nutcracker, dancing an “Arabian” variation choreographed by John Clifford as a playful pas de deux. Both young dancers were struck by the difference between performing in venues such as Lincoln Hall and the opera house in Santa Domingo, valuable experience for them since they are destined for professional careers. 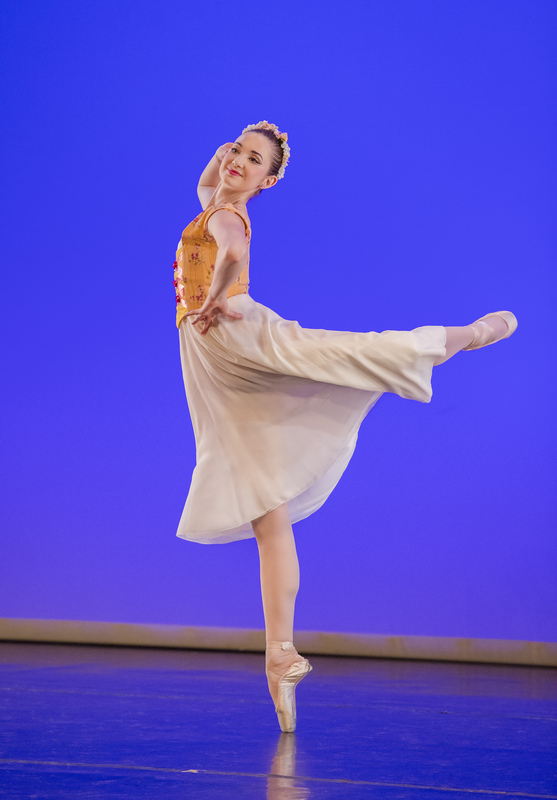 Kness will participate this year in Ballet Arizona’s summer intensive, on scholarship. Winslow will hone his modern skills in a Limon workshop, and attend the Boston Conservatory in the fall, also on scholarship. Members of the TPB Youth Company danced barefoot in former BodyVox dancer Lane Hunter’s Abandon All Plans, accompanied by a compilation of music by Hans Zimmer, Amiina, Zoe Keating and Loney Dear. Hunter’s title came from his experience in choreographing the piece, he says in a program note. Despite careful planning and notes, until he abandoned his preparation, he had trouble getting the piece to jell. It is nevertheless a skillfully put together piece, with a beginning, a middle and an end, replete with floor rolls and other grounded movement. It was well and faithfully danced, if a tad too long. In contrast, Tom Gold’s Festival Russe, which closed the show with high-spirited Balanchinean speed, wasn’t nearly long enough, and I can’t remember the last time I thought that about a piece of 21st century choreography. Gold was a member of the New York City Ballet from 1987 to 2008, joining the company four years after Balanchine’s death, and over his years there he danced many roles calling for speed, precision, elevation and éclat, including Balanchine’s Tarantella, which I saw him do magnificently and unforgettably toward the end of the last century. In Portland we saw him as a guest artist in an early performance of James Canfield’s Romeo and Juliet, and several years ago he choreographed on the students of Oregon Ballet Theatre’s School, a concert I unfortunately did not see. Festival Russe was originally made on the students at Ballet Academy East, in New York, a descendant of the Fokine School in the same city, for a Russian-themed program. The music Gold selected – excerpts from scores by Aram Khachaturian, Dmitri Shostakovich and Nicolai Rimsky-Korsakov – is Russian to the core and definitely linked to the repertoire of Diaghilev’s Ballets Russes, as well as those that came after it. I saw traces of the Polovtsian Dances, echoes of Les Sylphides, movement from Firebird, Petrouchka and Massine’s Boutique Fantasque (TPB frequently dances John Clifford’s staging of this) performed at lightning speed. And audience members hungry for such bravura turns as pirouettes a la seconde and the whip turns known as fouéttés were well fed indeed. I was especially impressed by the male dancing here; Gold’s coaching really showed. And in every piece on the program, you saw the results of the training received by the participants in the Career Track program, founded and headed by Mueller, and the members of the Youth Company. This Saturday, June 10, The Portland Ballet will be holding auditions for the 2017/18 curriculum year at its studios at 6520 S.W. Capitol Highway. Information here. It was a wonderful performance, danced with grace and skill by these young dancers. Always thrilled to see what The Portland Ballet has to offer.